There have been a lot of cases when people end up losing their photos. You may delete them accidentally or your iPhone may get lost and even damaged as well. It might also cause the loss of photos when you are upgrading your iOS (such as the latest one iOS 11/12). Some of these photos may be really important for you and you wish to recover them at any cost. 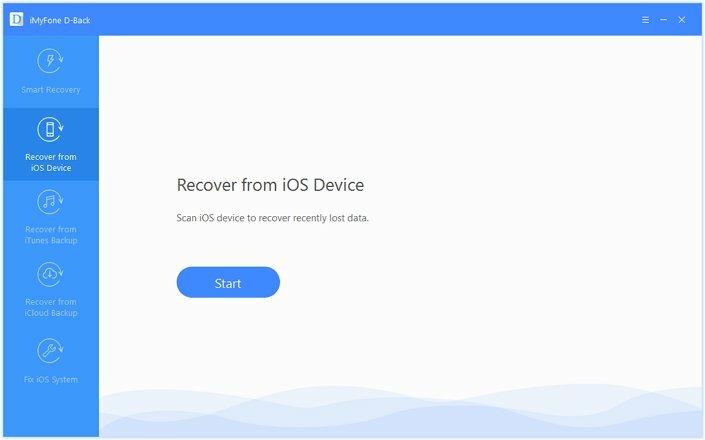 Here, we will talk about how you can recover deleted or lost photos on iPhone 7 using an iPhone data recovery tool. Before we begin it is important that you stop using your phone immediately. This is to reduce the chance that your lost data will be overwritten and hence render it unrecoverable. It may also be a good idea to check the Recently Deleted folder in Photos app before doing anything drastic. Sometimes, deleted photos can be transferred to this folder and all you have to do is to recover them. If you lost the data after a factory reset or restore, the photos may be very difficult to recover. The following solutions are however worth a try. The iMyFone D-Back iPhone 7 data recovery Win or iMyFone D-Back iPhone 7 data recovery Mac version is one of the best tools which you can use to recover your lost or deleted photos on iOS devices. Here is a snapshot of some of the top features. Four recovery modes can retrieve lost photos with utmost possibility: Smart Recovery, Recover without backup or from iTunes/iCloud backup. 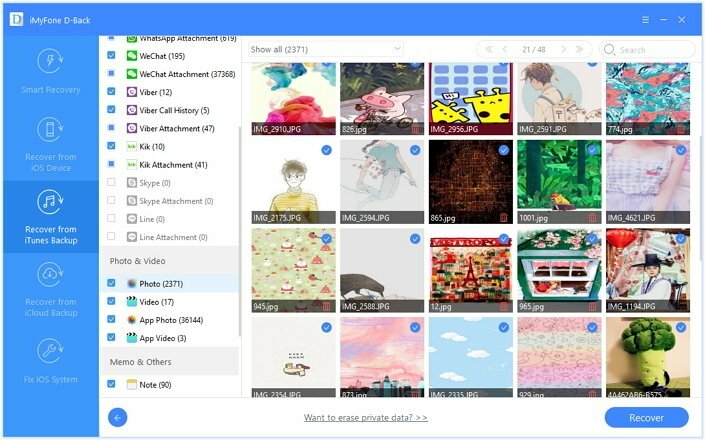 Recognized by Cult of Mac, D-Bakc can recover as many as 22+ different file formats such as photos, videos, contacts, text messages, voice memos and more. 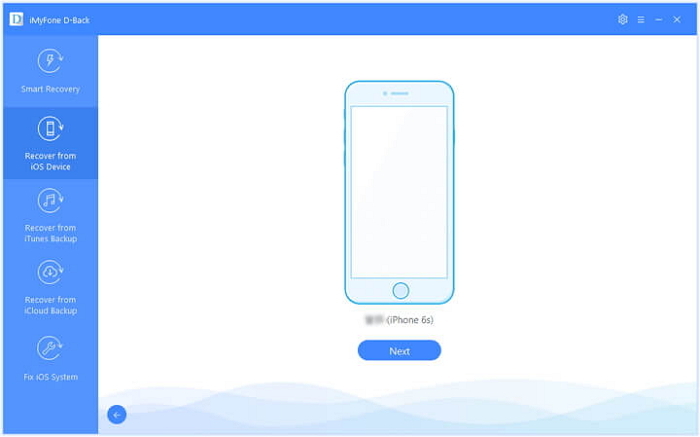 Support multiple devices such as iPhone 7, iPhone 6s Plus, iPhone 6, iPhone 5s, iPhone 5c, iPhone 4 running iOS 11/12 . Preview the files when you are looking to recover them. iMyFone D-Back provides 3 modes to get back lost photos from your iPhone 7. Choose the suitable modes according to your situation. If you do not have a backup, then here are the steps you need to follow for recovering your deleted photos. Step 1: Download iMyFone D-Back iPhone data recovery and install it. Choose the option "Recover from iOS Device". Step 2: Now, you need to connect your iPhone to the computer and let the program detect it. Step 3: You will find a list of different file types. Choose photos from the list and click on "Scan". Step 4: You will see a list of photos that were on your iPhone 7. Preview them and select the ones you want to recover. Click on "Recover" and save them at the desired location. If you have stored the photos to iTunes before losing them, you can recover your files too. Here are the steps you need to follow. 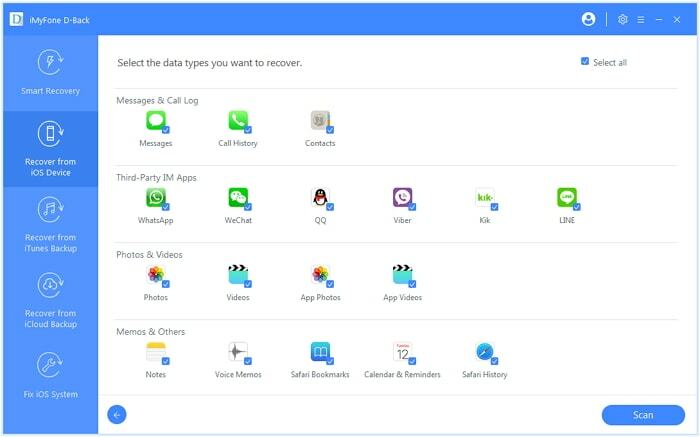 Step 1: Download iMyFone D-Back iPhone data recovery and install it. Choose the option "Recover from iTunes backup" as the recovery mode. Step 2: You will then see a list of the different iTunes backup files. Choose the backup file you want to recover and click "Next". Then choose the photo type to scan. Step 3: You can preview the different images and then choose the ones you want to recover. Click on "Recover" and save them to your desired location. When you have your iPhone photos stored in your iCloud account, here are the steps you need to follow for recovering the photos. 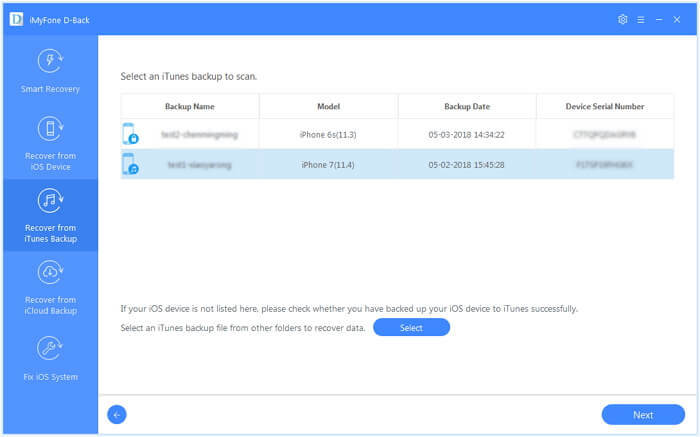 Step 1: Go to https://www.imyfone.com/iphone-data-recovery/ to download the program and install it. From the different recovery mode options, choose "Recover from iCloud backup". Step 2: You will now be prompted to enter iCloud credentials. 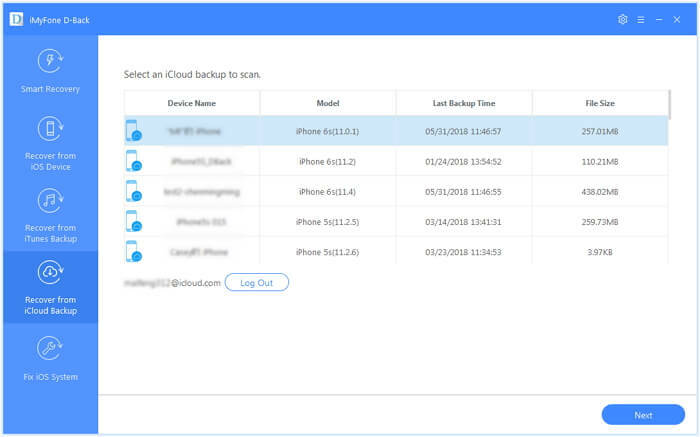 When you have entered the password, you will see the different backup files stored on your iCloud account. Step 3: You can choose the backup which you want to recover and click the "Next". In the next screen, choose photo type to download. Step 4: Look at the different photos to preview them. Select the ones you want to recover. Click on "Recover" and save the photos at your desired location. The above simple steps will help you easily recover your important photos on iPhone 7 regardless of how they were lost. The versatility of iMyFone D-Back (Windows version/Mac version) makes it the best solution for iPhone data recovery. 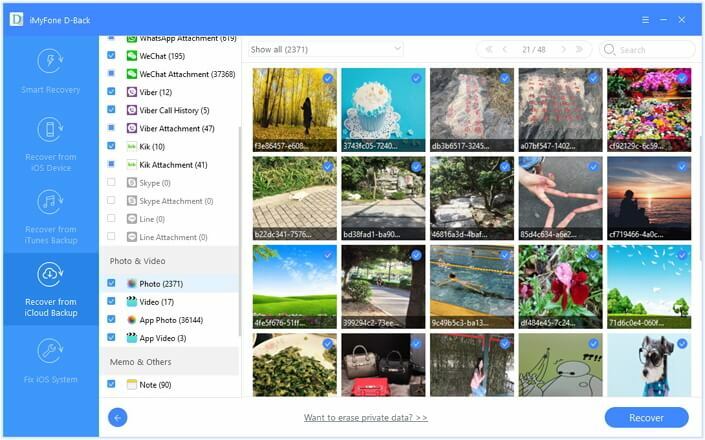 Give the Free Trial version a test drive today to see whether the program can recover your lost photos on iPhone 7!